My guide looks out across the steep scarps of Ghana’s Volta Region, a vibrant green landscape that folds and curves like velvet curtains. His eyes trace the ferrous-red roads scratched between the hills before settling on one of the villages nestled in the valleys. “It is that one,” he says, smiling shyly. I return the smile and point my lens in the direction indicated, the reflections of the corrugated roofs leaving a temporary blind spot on my retina. Snap snap. Camera returns to case and we share another awkward smile. We both know he guessed. He doesn’t have a clue where his country ends and its neighbour begins. Why would he? The border is almost meaningless here; someone else’s line marked out decades before, when the Europeans carved up a continent to their uninvited whims and ideas. It matters little in the day-to-day living of life. While one side is Francophone country and the other Anglophone, the shared Ewe language is the one used to talk to friends or family who happen to be on the other side. And an ECOWAS passport allows for easy, visa-free movement across the whole region (a privilege that no one here would ever think of giving up through a plebiscite). The name of the hill we are on – Mount Gemi – is another colonial legacy. This is not an Ewe word, not even Twi, but a contraction of the German Mission that came here to share the word of Christ, leaving a cross on its summit. Perhaps there would be a little more acknowledgement of the boundary if the Europeans had been a little more decisive, but it has shifted many times since then. Mount Gemi’s summit was once in a country that no longer exists, German Togoland. Little wonder that most ignore it. We leave the summit and its cross behind and set off back to Amedzofe. Most of the village’s residents are watching the local football team’s match – are the opponents Togolese? – but we continue past the pitch to the village square. Ghanaians wait for the cooler evening air to meet with friends, thus avoiding the worst of the daytime heat. This respite comes a little earlier in this hilly country – we’re at around 600m – and even though the sun is still out, Amedzofe’s older inhabitants are already congregating in stone seats, waving as we pass. Adjacent to this rendezvous point is the small visitor centre. Inside, my guide diligently asks his boss to identify exactly where the border lies. Maps are withdrawn from a large wooden chest and the obliging superior shows me where we are, then where the border is. My guide wasn’t too far off, and his face displays a mix of pride and relief. It’s around five miles away, the boss-man says; shall I take you there? I thank him and decline. Time to move on; there are more hikes to be had further along this invisible border. The border is much closer at Wli (pronounced ‘Vlee’, another linguistic leftover from the Germans). There’s even a checkpoint at the end of one road from the village, where the guards will happily mark your passport with Togo’s stamp and let you potter about in another country for a while, all for just a few cedis. A more popular activity for the growing numbers of tourists – mostly young volunteers who comprise Europe’s present-day, less disruptive mission to Ghana – is to the double-drop Agumatsa waterfall, the highest in West Africa (although not the only one to claim this title). An easy path meanders through fruit farms and forest to the lower falls, where you can swim in the plunge pool and sip coconuts after. But I opt for the harder route along the steep-sided cliffs of this natural amphitheatre, which leads to the upper falls. It’s a steep, sweaty climb, and its unpopularity relative to the signposted lower route is evident as my guide hacks constantly at the overgrowth – grasses, vines, saplings – barring our way. Eventually, after ninety minutes of slipping and sliding, swishing and swearing, we reach a viewpoint overlooking the hidden upper falls. Any waterfall is a captivating sight, but this one is flavoured with exoticism by being glimpsed through a thick frond of creepers and ferns. And it has further novelty to its name: the water leaves Togo, crashing down an 80m drop into Ghana. A truly spectacular border crossing. The path continues beyond the viewpoint, and at some point along it enters another country. But there’s no border post, no fence, no wall up here; nothing except a leaf-covered footpath and a neat stack of felled trunks, about a hundred metres ahead. Are those in Ghana or Togo? I don’t bother asking out loud this time. It’s just forest. Only when the border is close to running out of land does it assert itself. Lomé snuggles into the corner where the line meets the sea and here, things are done properly. I’ve always wanted to walk across a national border. Perhaps it’s a legacy of growing up on an island, where our neighbours are all a boat ride or tunnel away. And Ghana/Togo indulge me in style. Late one Friday evening, two hours after departing the heat and hustle of Accra, a taxi drops me in Aflao, a town whose main purpose is to wave goodbye to those leaving the country or welcome those arriving, the lines of snack stalls ready to provide sustenance on their way. From here, I proceed on foot beneath a crumbling arch, Ghana’s signatory black star on top, and wait for a stern border guard to scrutinise my passport for … what, exactly? Once waved through, I approach his Togolese counterparts. They usher me through without question; it’s late, they’ve evidently checked enough passports for one day. I raise a hand in acknowledgment and walk into another country. Now this is a border. There is change, distinction, separation. A city springs up immediately around you; no suburbs, no urban sprawl, at least on this side. Just a few metres from the neatly farmed fields that surround Aflao are high-rise buildings, crowded streets and that distinctive scent of city tarmac warmed by tropical heat. There is a busy hum of horns and engines, the chaos of a thousand people in each street, an urgency that only urbanity provides. It feels a long way from Mount Gemi and Wli, where the border is little noticed. Other changes, too. Motorbikes, largely absent in Ghana, zip all over; the bread sold by street vendors is long and crusty, not soft and stodgy. And the language of the capital, into which people from all corners of the country pour, is the communal French, local languages reserved for when you meet someone from ‘home’. Yet just a few metres back that way, barely a word of French is understood. I hail a motorbike, ignoring the common-sense warnings about riding on one without a helmet, and struggle to summon enough schoolboy French to get me to the hotel. Two days later, my brief sojourn over, I walk back across the border. The same taxi driver is waiting, as agreed, and we soon head west. ‘Do you know how the border is marked beyond the checkpoint?’ I ask. The driver gives me a bemused glance in his rear-view mirror, then turns up the radio so that it is loud enough to drown out any more daft, irrelevant questions from the back seat. Once, in Amsterdam, it rained forever. Rain spattered the aeroplane window and the strange and beautiful journey to Centraal Station, rain shrouded the Hotel Botel’s solid presence on the swollen Ij river, rain seemed to drain the flat sky of the last of the light. For three days we woke to the rain outside the cabin, felt a cool rain-wind in our faces on the deck, watched a coot’s nest bobbing in the wake of a passing barge. Rain on the red-brick façade of the railway station, darkening the old walls, rain on the cobbles, rain in the canals, falling softly, unceasingly. Our days were dominated by water. We were guided by the memories – not the ghost, for he is still mooching through the rain, still causing trouble - of writer Jeff Young, fresh with Amsterdam stories when I first met him thirty years ago. From his Amsterdam days I inherited a brown leather jacket and a heavy Dutch butcher’s bicycle, and in my mind’s eye he limps along Herrengracht in his junk shop overcoat, turns a corner, disappears. We drank in his bars, smoked Dutch roll-ups, had coffee in the windows of his brown cafés. I remember young leaves on the trees along the canals, the endless silver curtain of the rain, soft, gentle, almost apologetic. In the flea market on Waaterloplein I found a battered book, sepia images of the vulnerable doorways and ornate windows that we passed daily, generating a sense of déjà vu, of having known the city in the past. It gave a watery depth to our walks: we never seemed to be dry. From the Rijksmuseum the old painters reached out to us through the rain, washing the tall counting houses along the great canals in clouds and bright skies, illuminating street conversations with a sunshine we never saw. I remember the Frans Hals canvases in Haarlem, scrubbed puritan faces in blacks and greys, explosive white lace flashes at throat or cuff: outside, the rain-crunch of gravel, the green shine of leaves in a clipped garden, the screaming of swifts falling on us like an unseen cloudburst. Amsterdam was a sea city on the edge of Europe. At night we walked home through Centraal station, beneath the great trains silently leaving for Antwerp, Rome, Vienna. It was city of wet golden distances and black waters, a city of brick streets, cyclists, walkers. On the evening of our last day we drank in the little hotel bar, a glass box on the deck, the golden lights and blue flags outside smeared by the streams of water. If we choose, if we are fortunate, places do not leave us. Liverpool too is a sea city on the edge of Europe and, cycling along old brick streets to city parks and smoky bohemian cafes, I allowed Amsterdam to tint the whole city. Eventually all Jeff’s gifts continued their journeys without me – the butcher’s bicycle was given to the elderly American in the flat downstairs; beyond repair, the leather jacket was artfully displayed on a dustbin and walked off on its own. And it was not hard to imagine the city as a water-city, as had once been dreamed; canals and huge industrial channels opening from the Mersey, seeing Liverpool’s old streets as a criss-cross of narrow waterways. Gradually this feeling slipped away, and the old streets felt less watery. But even today, if I am lucky enough to walk the city in the rain, the belief that Liverpool is a city of ghost canals rises to the surface once again. And we're back... with a call for submissions! Did you miss us? It has taken a little longer than we would have liked but the good ship Elsewhere is sailing once more. 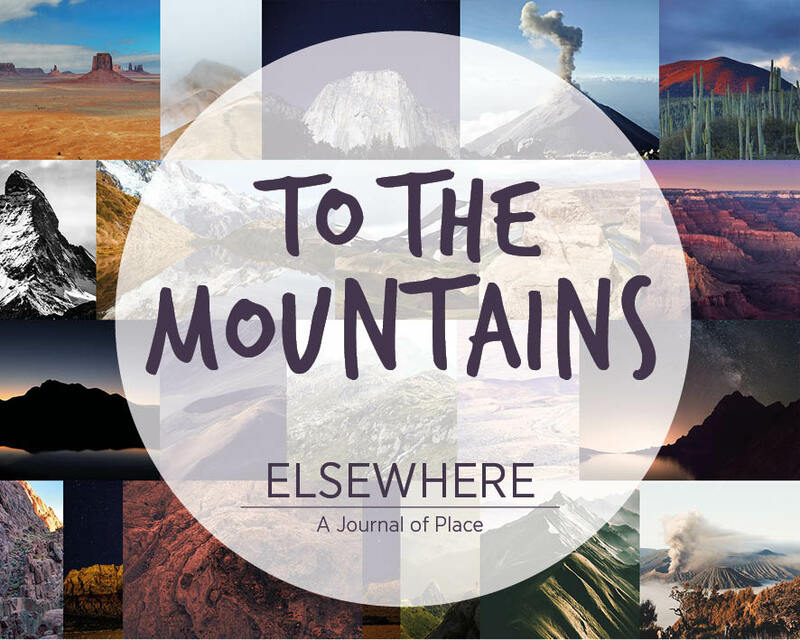 Starting this week, we will be bringing more writing, visual arts, music, events, interviews and other place-related literature and art to the Elsewhere: A Journal of Place website as well as a revamped newsletter detailing everything we are up to that we plan to send out twice a month. You can sign up for the newsletter here. To get us started though, the big news is that we have finalised our plans for the next print issue of the journal, and we want your submissions. ELSEWHERE NO.06: TO THE MOUNTAINS! The sixth issue of our print journal will be published in Autumn 2019 in a limited edition print run and we have opened a submissions window that will run until the 30 June. We are doing something different with this sixth edition of our print journal and invite submissions of prose, poetry, illustration, photography or other visual arts that are related to our theme of place and that have the name of an individual mountain as the title. Beyond the limitations set by the title, for prose (fiction or nonfiction) there is an upper word limit of 5000 words and we would like to read completed pieces. For visual arts we are happy to consider a proposal but it would be great to see some examples of your work. Please send all submissions for Elsewhere No.06 to paul@elsewhere-journal.com. Please note that, unfortunately, we do not pay contributors to Elsewhere. We have long had this as our aim, but the project as it is right now cannot sustain it. As a literary journal with a small print-run and sales, with no advertising or any external support, we have very little room for manoeuvre. In the four years since we have launched, neither Paul, Julia or any of the team have been paid for their work on the journal. We are always open to submissions for the blog where there is no theme other than place. We are especially interested in work that would benefit from being published online, such as film and music, and when it comes to prose we rarely accept work for online publication that is more than 1000 words. To submit your writing, photography, artwork, music, illustration or film on the subject of place for the blog the address is paul@elsewhere-journal.com. We would also like to use the blog to showcase any place-related events, readings and exhibitions, anywhere in the world. If you have something that you think would be of interest to our readers, please let us know. The financial situation at a literary journal such as ours is always precarious, and so we will be hoping to sell as many copies of Elsewhere No.06 in advance as possible. Unlike with previous issues, No.06 will be only available through our website. We will be making the issue available for pre-order in the summer so please sign up for our newsletter to keep track of where we are up to. In the meantime, if you would like to support the journal, please consider buying one of our back issues or a double set via our online shop. We are really pleased to be moving with Elsewhere once more, and we can’t wait to see what we get, both for the print issue and also for here on the blog. Thanks to everything who has supported the project up to now, and for your patience since Christmas. 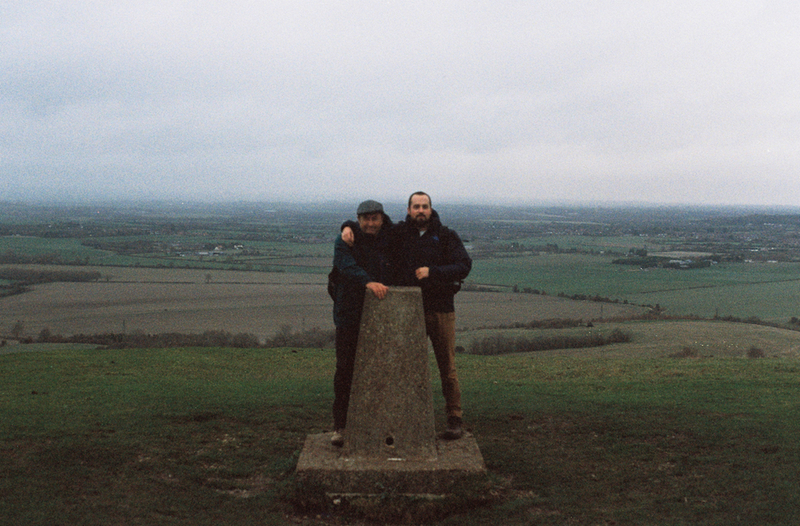 Since Spring 2018 we have followed Nicholas Herrmann as he walked the length of The Ridgeway, an ancient road stretching for eighty-seven miles across chalk downland between Overton Hill and Ivinghoe Beacon, in memory of his grandfather. With this final installment, Nicholas’s journey is completed. You can read all five parts of his walk here. Tiredness threatens to fell me like a storm-damaged tree. It squats in my skull, crawls down my body: tightening tendons, tying muscles into knots. My back is rigid, my legs are locked, and the ankle injury that started in Uffington has spread to the ball of my foot. I feel semi-petrified, almost stone. At the Ridgeway’s eastern extremity, I step from the car stiffly. I might have forgotten to stretch this morning, or I could have a cold coming on, but maybe this is what seventy-three miles feels like – an accumulated tiredness, the journey catching up with me, the way adding weight. It’s the eve of my thirtieth birthday, and I feel old. I just have to make it another fourteen miles, today only half: Coombe Hill to the hamlet of Hastoe. We arrive to mud and wind, the night’s rain wiping the world of colour. A short walk along a road and across a field takes us to the lip of the scarp, which we traverse like trapeze artists, balancing high above the Aylesbury Vale. Shortly, we reach the Coombe Hill Monument: erected in memory of the men from Buckinghamshire who died during the Second Boer War. The huge column has on top a torch of gilded flame, with four stone orbs positioned on plinths around its base. It marks the Edge of the World. This is where, on Sundays, my grandparents would bring the children to run off steam when they lived in nearby Chalfont. I can see why they gave this place such a striking title: sitting on one of the highest spurs of the Chilterns, the monument marks a precipice, transforming the hill into a battlement. With my neck craned, I circle the column that has twice been damaged by lightning since it was first erected in 1904. Before pushing on, I look back the way we’ve come, searching the horizon for the scrawl of the Berkshire Downs. Gradually, the sun pushes through the tangled sky to illuminate the landscape, bringing back words from another Ridgeway memorial: Light after darkness. Hope in light. The path eases us on to Bacombe Hill, the last chalk hill before the Wendover Gap, and down into Wendover. We stroll along the main street past the town’s many pubs, resisting the siren song of red lions and white swans, opting instead for take-away pasties to warm our wind-bitten hands. I scold my mouth on the cheese and onion filling, as ahead of us clouds shroud the hillside, Wendover Woods becoming Fangorn Forest in my mind. Then, through a small park and past the burgeoning Wendover Memorial Community Orchard, planted for the fifty-nine men from the Parish of Wendover who died in the First World War. The River Misbourne joins us for a way – a charming chalk stream that runs clear and shallow. Once more, the path slopes gently upwards and away from the town, the ground yellowing as we trample the last of autumn into the earth. We’ve walked all the way to winter: the trees are skin and bone now, bark and branch. Old chalk pits riddle the hill like ancient craters from a meteor storm. As we approach the summit, a sudden gust of wind eviscerates the clouds, the sun hurling our shadows into the trees and igniting the forest. We reach the car as the world grows dim, vapour trails skating across the glacial sky. 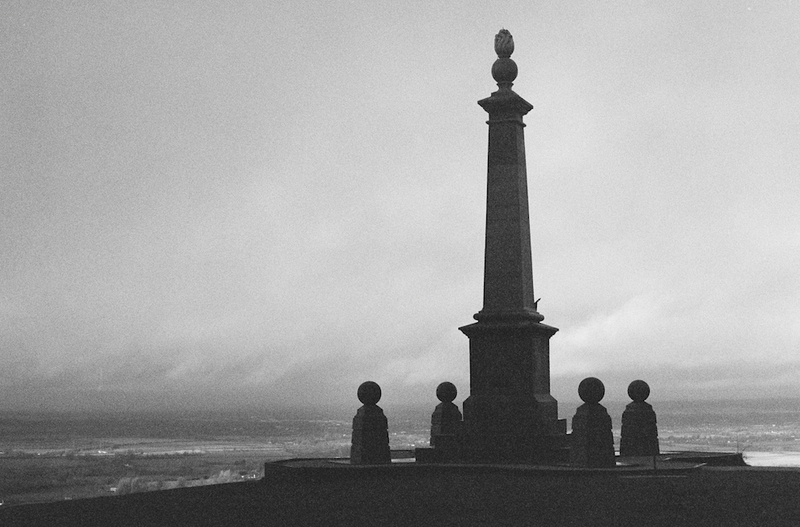 Back at Coombe Hill, we walk out to the Edge of the World, its torch now dark. On a cold bench we drink the last of our coffee, as the lights down in the Vale – Wendover, Oxford, Aylesbury – shiver into life. The last day starts with a detour. 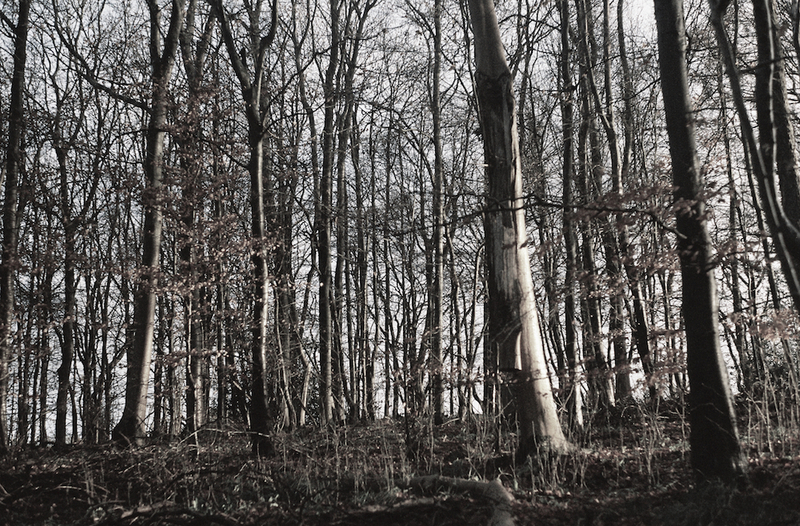 A mile or so from Hastoe is Hardings Wood, a sixteen-acre patch of ancient forest that Richard Mabey bought in the early 1980s, turning it into a community wood project to clear out inappropriate plantings, and free up regeneration. When Mabey’s depression struck, the land was almost lost, saved at the last minute by a local trust set up by two of his friends. It’s a difficult place to find – at first we drive past the coordinates, expecting a sign or stopping place. After consulting the map, we double back to find the entrance hidden beside a narrow country lane. The wood itself is steep and compact, the path barely visible beneath the brambles. It feels untouched, almost forgotten. I’m with my parents and brother for the final day of our journey, the four of us winding our way to the wood’s centre where we unpack our flasks and have coffee in the trees. The bitter steam mingles with the smell of the forest floor: earthy and warm. It’s quiet, the wood sheltering us from the morning’s chill. Above, beech trees bend in the breeze that cannot reach us. I don’t know if my grandfather ever came here. I never spoke to him about Richard Mabey – I only discovered the writer’s work this year. But something about Mabey reminds me of John; the two seem like kindred spirits – the same generation, the same interests, the same bewildering knowledge. I know my brother bought him The Cabaret of Plants, and he owned a copy of Flora Britannica that he kept on a shelf guarded by dragons. Perhaps John did make the trip here once, or at least imagined he was here, sipping coffee in the leafy quiet beneath a creaking beech as he flicked through Nature Cure or Home Country. On the Ridgeway, we amble along the tree-lined King Charles Ride – the straight, main path through the woodland of Tring Park. Further on, my mother picks a palmful of rose hips and shows me how to eat them, gently squeezing out the sour orange jam. To me, rose hips aren’t delicacies – they’ll forever be ‘itch bombs’, the stuff my friends and I would put down each other’s backs at school when we weren’t pelting each other with ‘puff balls’, the strange white berries that burst on impact and popped underfoot. I find these beside the path, too: snowberries. My father tells me he used to do the same, weaponising nature in the playground. I picture him tearing around Coombe Hill with a fistful of puff balls, and wonder if John ever did the same. To children, some things are so perfect, they’re obvious. Twenty years ago, the site of rose hips and snowberries would have caused the walk to descend into war, but my brother and I move on, leaving behind the ammunition and continuing into the next field. We cross over the A41, where from the footbridge I glimpse the Beacon for the first time. My feet feel lighter as we hurry past the train station at Tring – a town famous for a pair of dressed-up fleas at its Natural History Museum, which John loved and took us to see when we were small. We pause on a bench at the foot of a hill to look back at the town. The final outpost before the Beacon. As we start the last ascent, I feel the familiar swell of fatigue. My family must feel it too – the next couple of miles are covered in silence. We crunch over beech masts and climb through a wood, emerging to turbulence. The end is now in sight. We can feel its pull. Our pace quickens: a race against the dying of the light. Beneath us, a disused quarry floods the landscape with green water. As if to urge us on, a red kite sweeps up the hillside and hovers unsteadily overhead, before pitching and rolling away. Our party continues, floundering along the undulating ridge, the distance between us growing, the Beacon bobbing in and out of site like a life raft. 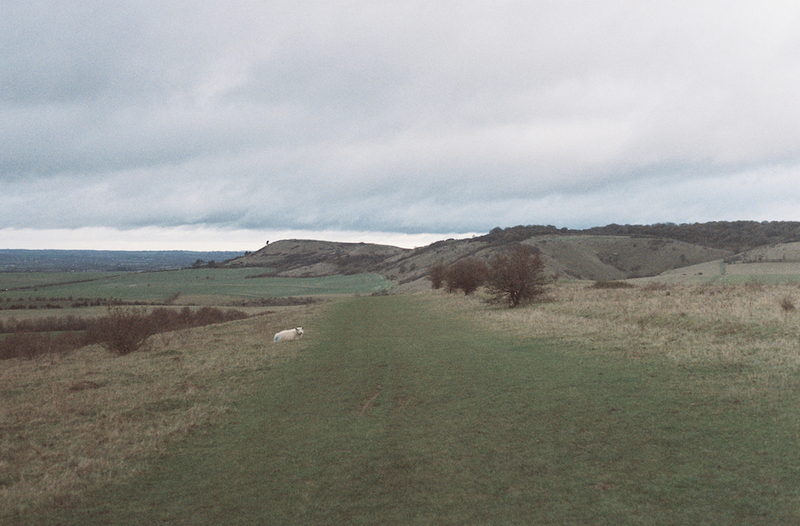 I wait for my father at the bottom of Ivinghoe Beacon, and together we finish the trail. A trig point and a map are waiting at the top. We trace the path with our fingers, recalling the places we’ve passed through. Then we walk to the edge and look back towards Avebury, finding nothing much in the haze. The wind soars up the slope and swirls around us; in the Vale, the clouds lean on Ivinghoe. The forecast promised rain this weekend, but miraculously not a single drop has fallen. Before heading back, I whistle across the valley, weee-ooh, ee oo ee oo ee oo, and wait for a reply that doesn’t come. It’s been twelve months and a cycle of seasons since my grandfather died and we unfolded the map. It’s hard to remember a time before the Ridgeway, and I don’t want to. The path has been a lifeline, a conductor, a tether. It’s allowed me to learn about John, understand the rhythms of his mind. Now I’m faced with the end: in front of me the path stops, cut off by a steep slope, the lights of Leighton Buzzard blocking the way ahead. But when I turn to leave, I realise where I’m standing isn’t the end at all. It’s the beginning of the trail – the old road is unfurling in front of me, eighty-seven miles to the west. It’s all yet to come: the beechwoods and berries, Thames and downs, the castles, chalk and sarsens. On the way back to the car, my father and I start discussing where to walk next, making plans for the new year. When a star dies, the collapse can create an event of such immense gravitational force, matter is compelled from far and wide, and all light is extinguished. That point in space, once brilliant and warm, turns impossibly dark. But after the collapse, the remnants might form something new. Drifting through space to gather together, finding each other, beginning to grow. And maybe, if the conditions are right, infalling molecules will gather momentum to create light from nothing; a blinding equilibrium to eradicate the dark. Light after darkness. Hope in light. Approaching along the peninsula, the town seems to lie at the end of the road, like reaching a final destination. A castle stands guard over the quiet estuary, dramatic and imposing, its battlements slowly reclaimed by the landscape. It is a trip I embark on as much to look for traces of the past, a memory of a prior visit fifteen years ago. Arriving at the hour of dusk in early spring, the town quiet and deserted, the Boathouse already closed for the day. We walked along the street to the pub where Dylan and Caitlin Thomas used to drink together in the evenings. Then we continued our journey into Pembrokeshire, driven on by the time. I am thinking of a photograph on a beach somewhere on that trip to Wales. Dark clouds and grey sea. There is synchronicity in the image; our faces are together, touching in the half light. When photographs were still like slips of chance on the paper. Thinking about being outside as night fell in the mountains, sharing a bottle of wine; jubilant in the almost total darkness, with no lights to guide us home. Today I am on time to make the pilgrimage and see inside the house, but I had imagined my return differently, that I would have more time to look around and to absorb the atmosphere of the place. I am distracted, harassed; my mind caught in the argument we had this morning, still unresolved. Family life spinning around us, its currents of confusion. I am looking for clues of something. Thinking back to a simpler time and recalling pictures of my past self, shrouded in the rain-soaked hills and twilight of the Welsh skies. Dylan Thomas is important to me. His poetry resonated with me, the colour of language. He gave me a way to think about death and the passing of time, and about change. Thomas lived in the town with his family, and for the last few years of his life acquired the Boathouse and the writing hut. It is a place in which he wrote some of his most important poems, and a place that witnessed arguments, the disintegration of his marriage, of his body. A life lived outside convention. The house is understated, leaving scope for imagining life here. I look around, my camera stuck on sepia mode, nostalgia in the recreated drawing room space. A notice explains that this is not the actual furniture, much of which Caitlin sold in response to the ever-advancing demands for money, the unpaid bills. Family photos on the wall. Dylan and Caitlin in a rowing boat, his deep brown eyes stare into the camera. The exhibition tells me that Dylan would retreat to his writing shed, away from the noise of the children, from the travails of family life. The closed door. I look out from the window at the far-reaching view out into the bay, across the estuary, outwards to sea. Thinking about the precarious balance of art and life, between real life and life on the page, and about trying to carve out a space for one from the other. Thomas is seen in a pure sense as an artist, one who created his art and placed it above all things, the artist as genius, demon angel, doomed to destruction. I continue back along the path to the writing shed. It is beautifully restored and has inspired many aspiring artists, as the photographs and paintings of it attest. It is overlooking the water, the sweep of the bay and the harbour where boats lie, picturesque, as if cast adrift from the sea. 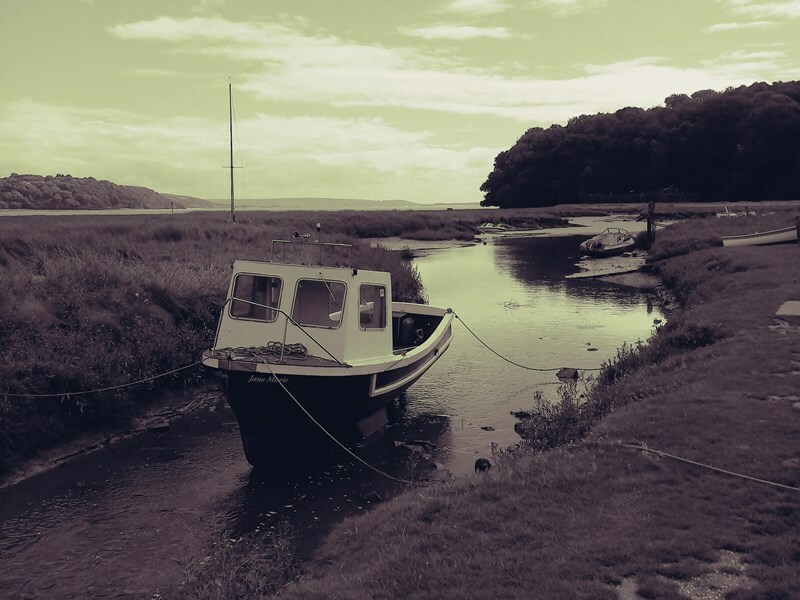 A place to think about moorings and being unmoored. I am always compelled by images of writing spaces and desks, by descriptions of how and when writing takes place. I think of my own chaotic balance of writing and life, the hasty tidying away of books and paper to make a space for living, my writing is always on the move, from one place to another. A dedicated writing space where things could remain untouched is every writer’s dream. Where, as Caitlin explains, from two until seven each day – often she would lock the door - Dylan would disappear, returning hours later with a perfectly crafted line or two of poetry. In his writing space, the many lists of words he compiled. The possibilities of language, and the meticulous hours spent in constructing a single sentence. Looking out to sea, a retreat away from the domestic confines of home, exposed to the waves and sealed off. 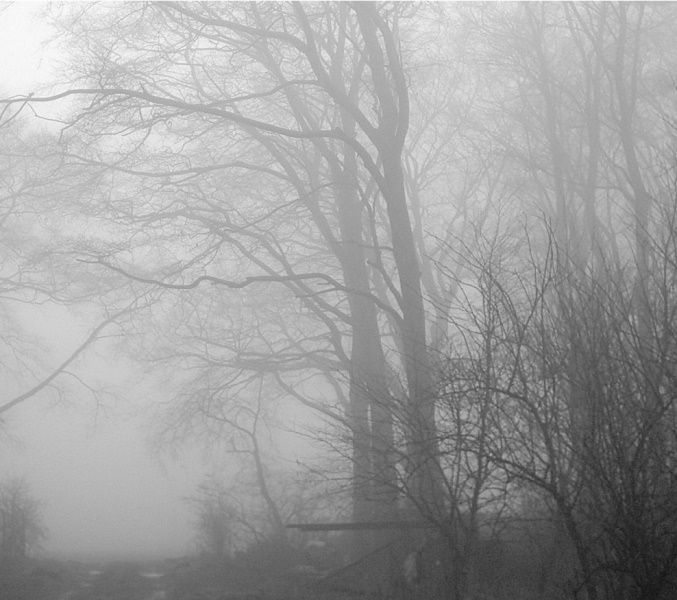 Leaving the writing shed, I begin to walk, thinking to head back into the town. There is a path leading to the churchyard where Thomas is buried, and a sign says that ‘the path to Dylan’s grave can be muddy.’ It occurs to me that I am the same age now, as Dylan when he died. I would like to keep following the path but I am uncertain where it goes and how long it will take. Instead I read your messages, you are wondering where I am, how long I am planning to be away. Looking back as we drive onwards, the remains of the castle unexplored, the map open displaying the route along the coastline, the town falling away behind us. Now I see that the road continues. Anna Evans is a writer and researcher from Huddersfield in the north of England, currently living in Cambridge. Her interests are in migration and literature, cities and movement, and she completed an MA in ‘Writing the Modern World’. She is currently working on a project on the places in Jean Rhys’s fiction and has recently launched a blog playing literary detective around Paris and London in seach or Jean Rhys and other wanderings, titled And The Street Walks In. The Low Country of coastal South Carolina and Georgia in the eastern United States carries an unmistakable slow charge. It is a place I know as a sun-filled haven when my more northerly home is dusted in snow. Many times have I slipped through the outstretched hand of winter and driven for hours into this story-laden place where time winds itself into a warm, quiet sigh. I sojourn here not only to remember the feeling of sun, but for the sense of otherworldliness that flowers quietly the closer I get to the Low Country. It is a tiny universe unto itself, utterly unlike anywhere else I know. I think of the Low Country and I think of hot red-dirt roads plunged into a cool line of live oaks; of coastal forests spun with endless waves of Spanish moss and the heavy scent of sea air; of snowy egrets standing in warm December sun, plunging their sharp beaks into still waters to catch unsuspecting fish; of cooking fresh shrimp in a tin pot on the edge of a saltwater marsh as twilight colors the air; of little tin-shack gas stations in the middle of nowhere, their owners inexplicably encased behind a window of security bars; of boiled peanut stands strung along the edges of slow, lonely highways between Savannah and Charleston; of talking to black Southerners and wondering if they constantly wear the weight of a history not of their choosing; of huge wooden churches forgotten in warm, silent forests; of deep-blue skies in the middle of the winter, charging my sun-starved Northern soul. It is a relief beyond all else to arrive in the Low Country and see that distinctiveness is alive and well in the United States. We are a country unfortunately infamous for our ability to transform unique landscapes into characterless duplicates. One need only visit the suburbs of a large city or any number of desiccated small towns to see what the power of unchecked profit-driven growth can do. We are a country often shamed by our history, and so we shun it, and old buildings and old customs and old landscapes are thrown out and everything must be new, new, new. We are also a people who have been raised on the myth that familiarity and convenience are to be prized above all else, with the disquieting result that whether you are in South Texas or Eastern New York or Central California you can find many stretches of concrete wasteland that look disturbingly similar. Stunning landscapes and unique cultures are there, but they are often hidden beneath a plastic veneer. The Low Country is no different; it is not a haven set far away from the impingement of runaway capitalism. And yet it effuses an inescapable uniqueness, not because of being untouched by this crushing sameness, but in spite of it. The Low Country was the first place to show me that uniqueness often persists just outside our field of vision. Though many of the wealthier communities in the Low Country have managed to avoid the devastation of strip-malls and 6-lane roads through the middle of town, most of these parts of South Carolina and Georgia are, in fact, uniquely drowning in the afflictions of unwise city planning and unbridled development. They are often prime examples of the very worst of such development, with not only McDonalds and Wal-Marts filling the car-choked streets, but all sorts of unimaginable Southern takes on fast-food and cheap buys also lining up for their bite out of peoples' pockets. The affect can be dizzying in its ugliness. And yet - here is the crux of it - and yet it is still beautiful, it is still distinct, it is a place thoroughly itself. People still talk differently here, little idioms and turns of phrase that leave a Northerner like me baffled and smiling; the tall, stalking shorebirds and the quick lizards and the huge, breathy flowers will all tell you you're in a place distinctly its own; the saltwater marshes still mix with the ocean and fill with her waters at high tide; you cannot miss the genuinely slower pace, the shockingly different view of the Civil War, the quizzical looks you receive when you ask if the blue crabs they're about to boil are still alive; no number of phony-looking "Southern Style" housing developments can shake the drenching experience of walking through a neighborhood of shotgun shacks or through a live-oak avenue of antebellum mansions. No matter how much a place is overrun with attempts at uniformity, commercialization, or purposeful forgetting of complicated histories, there are some things that can't just be coopted, can't be charged for, can't be erased. For this knowledge, I am forever grateful to the imperfect, saturating beauty of the Low Country. Bridgett Brunea is a writer, naturalist, and rambler originally from the northernmost reaches of Appalachia in the eastern United States. In writing and in life, she seeks to experience and convey the luminous meeting point between inner and outer landscapes. She is creating an online journal of observations, meditations, and questions (terrasanctum.world) which she hopes to make available in 2019.
through two embracing ash trees. The moon was out, a pamplemousse moon. and felled trees gone back to nature. perhaps because of the industrial past. a kissing gate. A bicycle could fit. I saw a different face. dying Scandinavian oak, an Ogham book. as I listened from my parrot cage. an agility course – steps to a steppe. charcoal for miles and miles. Patrick Wright has a poetry pamphlet, Nullaby, published by Eyewear (2017). A full collection will follow in 2019. His poems have been published in several magazines, most recently Wasafiri, The High Window, and The Reader. His work was also included in The Best New British and Irish Poets 2018 anthology, judged by Maggie Smith. He teaches Arts and Humanities at the Open University, and is studying towards a second PhD in Creative Writing. Liverpool has a small old Jewish community but, as Islam and Hinduism are traditionally not strong faiths in the city, even now there are few mosques or temples. The religious landscape, fading or vigorous, is overwhelmingly Christian. Once the division between Catholic and Protestant was deep and strong. Protestant Orange Lodge marches and Catholic celebrations of St Patrick’s Day could lead to violence. Schools were segregated on sectarian lines and even the football teams were divided between Catholic Everton and Protestant Liverpool. These faultlines have largely disappeared. The new city can pall; too much glass, too much steel, too many towers. I turned inland to hunt ghost pubs, the alcoholic ruins along Vauxhall Road, where derelict Victorian public houses stand like broken teeth in a new urban landscape. 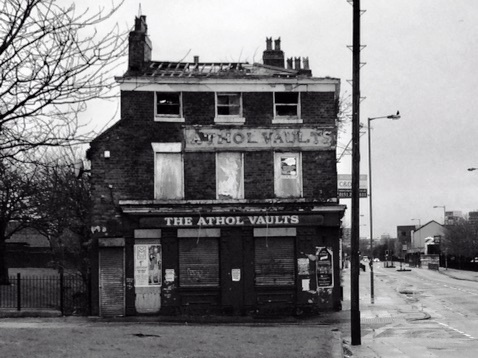 The Atholl Vaults, boarded and violated, plaster crumbling; the Castle, alive but closed; the Glasshouse on the corner of Eldon St; and wildernesses of bramble and buddleia behind faded advertising hoardings, the sites of mourned pubs like the Great Mersey, their ghosts silent. On Eldon Street I turned to the Catholic church of Our Lady of Reconciliation. Scaffolding and tarpaulins dripped with rain and melting frost, as if the huge church had just risen from the bottom of the sea. This was a strong Irish Catholic district, fiercely political. The area returned a Nationalist MP to the British parliament for over forty years, and a store of pre-IRA weapons was found in the cellars of a local pub in the late 1800s. But I found that this pub too had been demolished, leaving only a brick scar. I thought about taking one of the old bricks, to have a small piece of Liverpool Irish Nationalist history. But why? Perhaps one day the sounds in inanimate objects will be heard; the anxious voices, the thuds and curses as the boxes of rifles were manhandled downstairs; but not in my lifetime. From lost pubs, I began to see Catholic ghosts in road names and old churches. This was now a meander across a landscape of invisible parishes, destroyed shrines torn apart in the mechanised Reformation of the 1960s when Liverpool savagely regenerated many of the older districts. On Titchfield Street I found cobbles beneath the tarmac, stone Victorian ghosts, which took me to Trinity Catholic Primary School. A trinity of Anglican churches - St Martin’s in the Fields, St Alban’s and St Titus’s - were lost many years ago. The towers and walls of the Catholic St Sylvester’s survive, but they are embattled, razor-wired against vandals and arsonists, gradually being smothered by buddleia. St Brigid’s has suffered even more. Demolished for the Kingsway Tunnel, a slash of Brutalist concrete, it survives only as a place name behind St Sylvester’s, a clustering of Catholic names gathered as if for safe keeping. There are deep echoes of the Reformation on these old streets. St Sylvester’s stands near Latimer Street, named after the bishop who was martyred for his Protestant faith. Catholic churches, Protestant streets. Churches stand empty, street names have lost their meanings. Nobody in Liverpool takes these divisions seriously any more, only rain-tramps like me, trudging these darkening streets; only gutter-historians, church-watchers, people who care for the memories of the city. And we do not believe, we just remember. The people are still here, of course. Old terraced houses have gone and bungalows and semi-detached houses with gardens and driveways line the streets. Pubs and churches are the last to go, closed, abandoned to the weather, and then demolished, their love and faith dispersed, forgotten. But the people remain, living modern lives in a landscape of fading Victorian ruins, architectural, cultural, theological. My last ghost was a church that I had watched disappear. St Gerard Majella’s was a strange brick and concrete church near Scotland Road, and I watched it’s demolition over a month or six weeks. The brick tides of the city have closed over this sunken church, and the name survives only in a street and a new courtroom. I contemplated a further walk to Cranmer Street, another martyred bishop, another faded street bookended with ghost churches; but the rain was heavier and the day was darkening. I turned towards the river, and walked slowly down to the warm shiny truths of the new city.